Dua Lipa performed and won the 'Music International' award on Friday(November 16th) at the 70th Bambi Awards at the Stage Theater in Berlin, Germany. 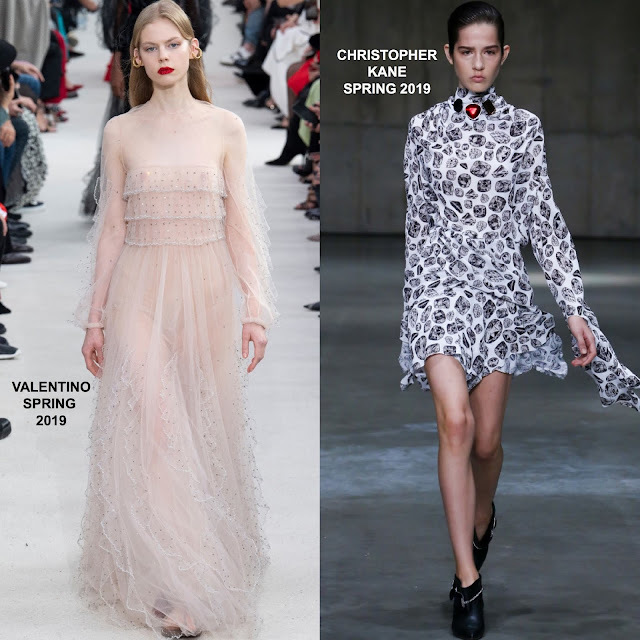 She arrived wearing a VALENTINO SPRING 2019 see-through blush pink layered organza dress, which was adorned with silver sequins and pearl trimmings. For coverage she lined the top and wore briefs under the skirt. She finished up with statement earrings and a complimentary beauty look. For her performance, she slipped into a CHRISTOPHER KANE SPRING 2019 gemstone satin blouse and matching mini skirt which she teamed with fishnets stocking and black leather, platform boots. She finished up her look with the same complimentary beauty look and statement earrings.